November 1979 issue of FM has some small tears around the staples(about an eighth of an inch), but cover is still firmly attached. Otherwise near-mint. Here's some trivia for you. 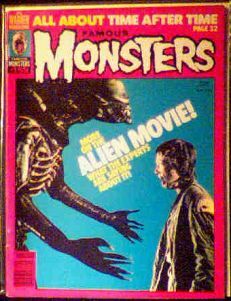 The terrified actress on the cover is Veronica Cartwright, who played the little girl in Hitchcock's "The Birds", and whose sister is Angela (Make Room for Daddy, Lost in Space) Cartwright. Website design and hosting by Sohodojo Business Services. Item 135 of 466 items displayed in viewer. 0 items in cart.